The Midwest is not historically known for it’s IPAs but that is changing quickly. The west coast has been knocking out bitter IPAs for more than a decade, recently Heady Topper has started to put the (north) east coast on the map. As for the midwest we’ve got a few serious contenders leading the way in Fat Head’s Head Hunter and Bell’s Hopslam among others. I prefer the Hopslam because it’s much more flavorful to Fat Head’s bitterness. Hopslam is a seasonal release with a somewhat small foot print, luckily Ohio and northern Kentucky are well within that footprint! Starting with six different hop varietals added to the brew kettle & culminating with a massive dry-hop addition of Simcoe hops, Bell’s Hopslam Ale possesses the most complex hopping schedule in the Bell’s repertoire. Selected specifically because of their aromatic qualities, these Pacific Northwest varieties contribute a pungent blend of grapefruit, stone fruit, and floral notes. A generous malt bill and a solid dollop of honey provide just enough body to keep the balance in check, resulting in a remarkably drinkable rendition of the Double India Pale Ale style. Very nice mixture of orange and honey colors that comes out very cloudy. Topped off with an off-white head that slims down fast. Not the prettiest or most stereotypical looking IPA but I really like it. Woooo massive aroma with honey, lots of flowers, and fresh cut grass. I don’t particularly like the smell of fresh cut grass, because it’s usually mixed with the stank of sweat from me having cut the lawn. However, I love the smell of fresh cut grass in beer because it’s a signal of lots of fresh hops. There is also some citrus but not as much as other IPAs and a hint of caramel from the malt. The first thing to hit my mouth is some fruity flower action. I’m getting a lot more orange citrus here than in the nose also more caramel as well. Only a mild bit of bitterness that is very enjoyable but not overpowering at all. The 10% alcohol is definitely noticeable and present but it’s not shocking or off putting in anyway. Mouth feel is a bit tart with lots of carbonation and a light body. Overall a very amazing beer that you’ve got to try! It definitely lives up to its name of slamming you with hops and does so in every kind of right way possible! 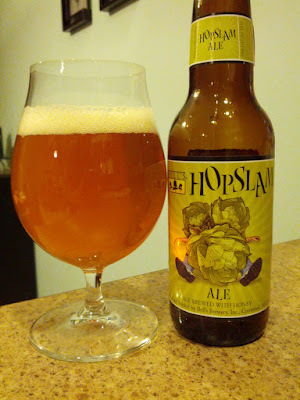 Pliny The Elder is great and Heady Topper is great and, now I’m not gonna say something impossible and rank them but, Hopslam definitely needs to be included in their ranks. As I said initially this should be easy to find in Ohio or northern Kentucky for the next few weeks. Still though, I recommend calling your better beer seller to ensure they have it in stock before heading over. If you find some buy a 6-pack (or two) for you and 1 to trade, this stuff is hot online and can net you some other good IPAs like Heady Topper or Pliny The Elder.